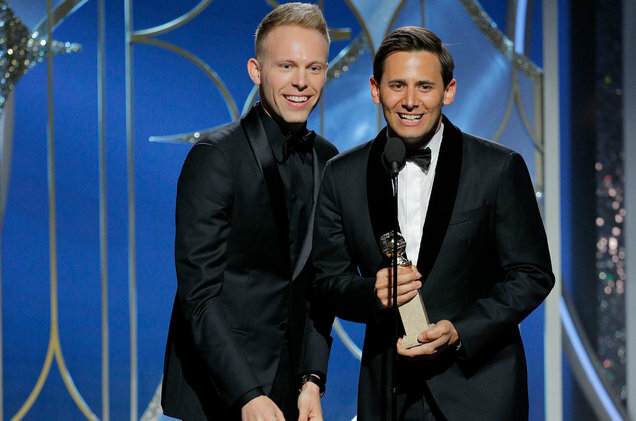 Benj Pasek and Justin Paul, the composers behind the soundtrack of The Greatest Showman, accept the Golden Globe Award for Best Original Song, Motion Picture at the Golden Globe Awards on January 7, 2018. This past weekend, the Golden Globe Awards recognized the wide range of talent that entertained audiences across movie theaters and TV screens throughout 2017. From the small-town noir of “Three Billboards Outside Ebbing, Missouri”, which won Best Motion Picture – Drama, Best Screenplay, Best Actress Motion Picture – Drama (Frances McDormand) and Best Supporting Actor Motion Picture (Sam Rockwell), to the coming-of-age tale of Aziz Ansari’s “Master of None” (Best Actor Television Series – Musical or Comedy), there was no dearth of rich, relatable and diverse storytelling celebrated. One of the highlights from the evening was the award for Best Original Song Motion Picture, awarded to the anthemic “This is Me” from the Michael Gracey-directed musical period piece, The Greatest Showman. A musical biopic set just before the turn of the century, The Greatest Showman follows the mercurial rise of P.T Barnum, founder of the Barnum & Bailey Circus, once billed as ‘The Greatest Show on Earth.’ The movie’s soundtrack was penned by Benj Pasek and Justin Paul, an award-winning duo whose work has been featured in the likes of A Christmas Story, La La Land and James & the Giant Peach. Among all their compositions on this soundtrack, “This is Me” stands out as a particularly rabble-rousing number, mainly for its context—it is sung by Keala Settle, who plays the Bearded Lady, one of Barnum’s many circus “oddities” that are ignored in the face of more conventional talent. Frustrated with a lack of recognition, the Bearded Lady belts out “This is Me” in unison with the rest of the circus troupe, paying homage to their resilience. Regarding the song’s meaning, Pasek revealed in an interview with Billboard that it was a testament to “people who had lived in the shadows their whole lives and for the first time, wanted to feel love and acceptance. Settle’s spectacular performance does justice to the inspiring lyricism of “This is Me”—with lyrics like “I’m not scared to be seen/I make no apologies, this is me,” Pasek and Paul composed a song that is unapologetic and fully self-assured in its tone. This is evident even in an interview with Settle and Gracey, where they discuss Settle’s initial hesitation of singing this song, blossoming into full-blown confidence. “There was a moment in the song that I was so scared that I had to actually grab Hugh’s [Jackman] hand so that I had somebody to hold onto” said Settle, describing the recording session for the song. “Then, we got to the end of the number, and all I remember is deafening, deafening applause. It was a sort of otherworldly experience.” In Gracey’s words, “it was one of those moments that will stay with me the rest of my life. Fortunately, we filmed it.” Sure enough, you can feel the amazing, vivacious energy of Settle’s performance and the entire cast in that filmed session (see above). Diversity of voice is an important part of the Levitt experience; with hundreds of free concerts around the country each year, Levitt’s roster of established and rising talent is as wide-ranging as our audiences. The message of uplifting unheard voices in “This is Me” strikes a chord with our mission of connecting individuals of all ages and backgrounds with music they may have never been exposed to before. Thanks to movies like The Greatest Showman, the power of music in reaffirming identity and diversity is brought further into the limelight. Congratulations to Benj Pasek and Justin Paul for winning this well-deserved award! This entry was posted in Beyond Levitt and tagged Best Original Song, Golden Globes, Movies, Pasek & Paul on January 10, 2018 by Rounak Maiti.